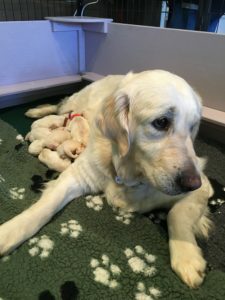 Our beautiful girl Harlow has one more litter planned for spring before her retirement. This is a great opportunity at this time to find her permanent family home. Although until she is finished with puppies, this is considered a ‘Guardian Home’, she will return to her chosen family for the rest of her life. This way she can enjoy the one on one attention she desires from her own family sooner rather than later. UPDATE, HARLOW IS IN HER FOREVER HOME!! Harlow is 3 years old, is very healthy and weighs around 90lbs. She is active, loves to fetch and swim and go on walks. But what she is most passionate about is FAMILY! She loves her people. If you are with her then she is the happiest dog on the planet! If you are looking for an adult dog rather than a puppy, this might be the ideal situation for your family. Harlow’s idea situation would be a family with kids, living no more than 45 mins from Britannia Farms. A large fenced yard and an adult home during the daytime. Interested? Contact Helen@BritanniaFarms.com for more information on Harlow, and the Guardian Home program. Marley and Martin expecting English Golden Retriever puppies! Peter Rabbit themed litter arrives at Britannia Farms! What do we feed our dogs? We feed our puppies Life’s Abundance Nutrition, one puppy at a time. Visit their site below. "He is your friend, your partner, your defender, your dog. You are his life, his love, his leader. He will be yours, faithful and true to the last beat of his heart. You owe it to him to be worthy of such devotion"